So let’s jump right in and break down this outfit. And we’ll start with the most obvious piece — this crazy H&MxMoschino gold sequin parka! I’ve been meaning to break out this bad boy for the perfect occasion. So when I was packing for New York, I knew it would be the item that I built my outfit around. PLUS, it’s a padded parka that was perfect for the cold weather. But what to wear that would simultaneously compliment, but not compete with the gloriousness of the jacket? 🤔 With Ilana‘s advice to wear a Mickey sweater, I knew this cropped Forever 21 sweater featuring a dazed Mickey would be perfect. I love that the graphic stands out from the jacket, but isn’t too busy to compete with it. And the yellow stars were such a fun way to play up the shimmer of the jacket. And of course to complete the look, I chose a fun, graphic bag! For the shows, I actually decided to carry my Cakeworthy Mickey hand bag, but I also like how my new Pixar hard case bag looks with this outfit too! I especially like how the star plays off of Mickey’s dazed stars. And the tophandle came handy since the parka is so puffy. Have you ever tried throwing a bag strap over a puffy jacket before? Not. Easy. And as a BONUS, here’s one other way I wore this crazy sequin parka with some Disney Style flair! After picking up this black and gold Mickey bag from the Shanghai Disney store, I knew it would look amazing with my gold parka and a sleek black outfit. And for an extra touch of Mickey, I wore these gold Mickey stud earrings I picked up from the parks a year ago. It was the perfect outfit for a late night dinner out in New York and SO easy to put together! Happy National Polka Dot Day! And say hello to the first #citydisneystyle post!🙌🏼 If you follow me on instagram, then you already know that this series is an idea I’ve been toying around with for the past month. After getting all your great feedback, I’m finally pulling the trigger! Tip 1: Choose interesting basics to pair with your dots. I love a good pattern mix, but for easy city dressing, I usually pair a pattern or print back to interesting basics. What do I mean by interesting basics?🤔 It sounds like such a contradiction, Alisa. Well, I’m talking about basic pieces with an unexpected point of interest. Basics with an intriguing detail that makes them NOT so basic. Notice in this outfit, that the points of interest in my black coat are the longer streamlined silhouette, slim collars, and distinct pocket details. For my bag, the mixed metal buckle feels unexpected. And blue tinted aviators actually pick up on the blue in Donald’s hat. These kind of small details help to elevate your basics from literal “basic clothes” to stylish staples that stand the test of time. Tip 2: Mix different styles into your outfit. 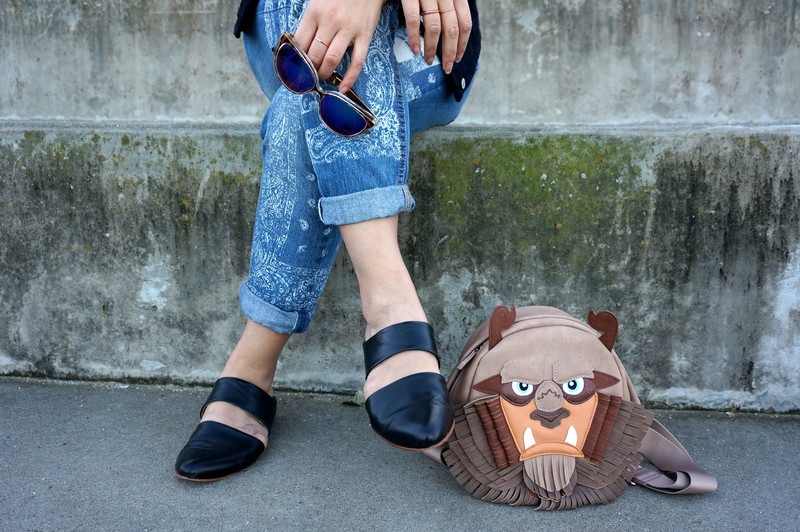 Mixing different styles is something I often think about when putting together a #citydisneystyle outfit. As much as I prefer to have a predictable life and schedule🙄, I try to go for an unexpected mix in my outfits. And when it comes to styling Disney pieces, mixing fun and bright with more refined items easily transforms Disney clothes into city clothes. Since I based this outfit on my flouncy Cath Kidston dot skirt, I decided to pair it with more structured items to get that nice mix of feminine and sleek. Again, my black jacket instantly adds polish with its sharp silhouette and my earrings are minimalistic and streamlined. Both give a nice contrast to a flowy skirt and that contrast is what taps into that “je ne sais quoi” cool city girl mood. Tip 3: Tuck it in! It’s such a simple styling “hack,” but it has so much pay off. For skirts or pants that sit at your waist, try to tuck in your top. Not only does it help keep the shape of your outfit, but doing a French or half tuck will also help you channel that cool Parisian city vibe. I mean, it’s called a French tuck for a reason!👩🏻‍🎨 Tucking your shirt in ever so slightly will instantly read as effortless and more polished. How do you like to wear your Minnie dots? Let me know here or over on instagram! What I’m trying to say with my horribly forced Christmas pun is that this year, I thought I would add some Disney flair into some of my holiday outfits. I figured that would be a good way to help get me into the Christmas spirit, since I’m usually more of a Halloween ghoul.👻😆 I mourn the loss of fall weather and Halloween candy for a month. Since most of my Disney pieces are casual, I decided to pair a casual shirt with a satin, silky skirt to dress it up. The mix of casual and dressy gives that cool, city girl vibe that I love. But part of the fun in dressing for the holidays is also being a little kitschy. Enter adorable Christmas light earrings!🎄 And since I have two ear piercings, I obviously had to capitalize on the opportunity and wear two pairs.😏 For this outfit, the green and gold pairs were the perfect accent colors. BONUS: The earrings are less than $5 on Kmart right now! What do you like to wear for holiday parties? Comment below what you’re going to wear for your holiday festivities or let me know over on instagram! A Day At Pixar Studios! Aaahhhhhhhhh! Where to even begin?! For many Disney fans, Pixar Studios is a supplemental, but oh so necessary part of the Disney company and experience. It’s like adding avocado to your BLT. Pixar just makes Disney THAT. MUCH. BETTER. Omg, Pixar is an avocado. No wonder everyone loves it!😆 So when I got the chance to visit the Pixar campus with some friends, I was ecstatic. We visited on a Sunday, which was actually really nice because it was completely empty and quiet. We could take a million photos with no one in the background! 🤗 An added bonus was the warm weather! If you ever visited or lived in the Bay Area during the summer, then you know that warm days during the “summer” months are like Pixar easter eggs — you only get them once in a while.😉 Cloudless skies meant I could wear a blue dress for my Guido disneybound without hesitation. I would’ve worn the dress anyways since Chelsea and I planned on being twinsies together, but great weather just made it that much better. P.S. Loved Cars 3! See it if you can! And Pixar being Pixar, they also scattered lots of magic throughout the rest of the property. Halfway through our visit, I headed for the bathroom. And when I reached the door, instead of the usual female silhouette logo, I spotted a familiar curvy, mom-bob, above-the-knee boot wearing superhero! She was incredible.😉 But my favorite surprises were the characters that were embedded into the floors! So while walking around, you could randomly run into some of your favorite characters! And of course, the pièce de résistance…Luxo Jr. and the Luxo ball! Erika slayed it and actually disneybounded as the Luxo ball, but by complete accident, we all ended up wearing similar style dresses all in yellow and blue.😳 And guess what, our separate disneybounds then became a singular one. We. Were. The Luxo ball. If that isn’t the definition of serendipty, then I don’t know what else is!